Show off your support for the Aviary Re-Design with a snazzy shirt! 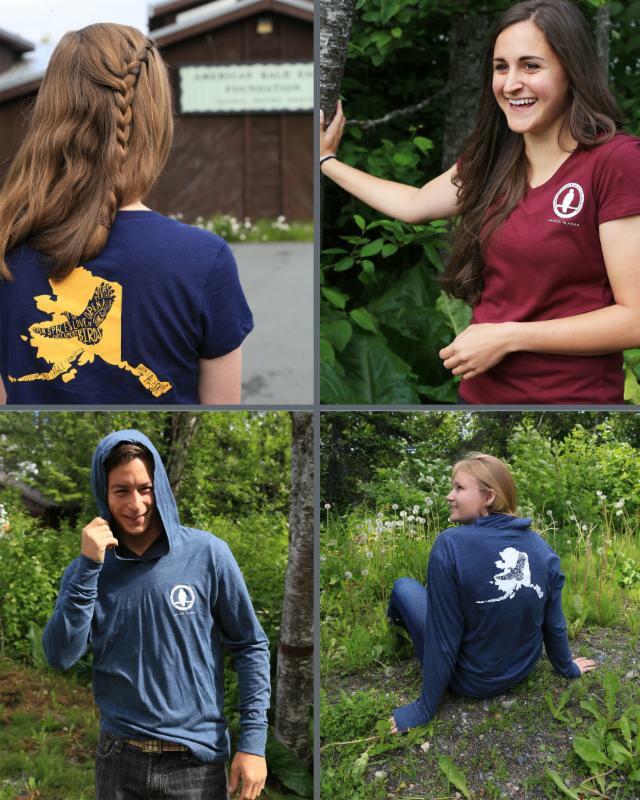 As part of our Aviary Re-Design fundraising program, the ABEF is selling special Aviary Re-Design t-shirts and long-sleeve hoodies. All of the profits from the shirt sales go to fund the Aviary Re-Design project, which just hit the $15,000 fundraising mark. The shirt features a silhouette of Alaska on the back with a bald eagle outlined in the middle. Former ABEF graphic illustrator and creative artist Claire Floyd designed the logo so that the writing in the eagle represents key features of the new aviaries. The short-sleeved v-neck shirts are ladies cut and are available in sizes small to extra large. You can choose between burgundy with a white decal or navy blue with a goldenrod decal. The long-sleeved hoodies are unisex and come in slate blue-gray with a white decal. They are available in sizes extra small to double extra large. Don’t delay; buy your Re-Design shirt before they run out! To purchase or view the ladies' shirts please click here. To purchase or view the unisex shirts, please click here. When you live in the valley of the eagles, spotting hawks is an exciting event. Earlier this month ABEF interns thought they spotted a lightish colored hawk just outside our building. Upon closer examination, it was determined the bird was a juvenile bald eagle. Because we have such a large population of bald eagles, we often get to see a variety of different colored sub-adult bald eagles. For those who don’t know, when bald eagles hatch they are completely brown with whitish wing pits (because of this coloration, they are sometimes mistaken for a golden eagle). As they mature, their body feathers transition to a lightish brown as they begin to shed their white wingpits and grow in brown body feathers. Additionally, their new head and tail feathers grow in white as they begin to age. Identifying the age of the sub adult bald eagle can be tricky, however we hope the below complied photos help. It should be noted that the change in feathers can vary by individual and that these photos should be used as a guide, but may not be exactly what every bald eagle looks like at these ages. ABEF is excited to welcome our five new summer interns. The internship program invites dedicated young people from across the country to join us for 12-26 weeks and learn what it takes to keep a non-profit museum and raptor center operating. Over the next few months, we will be featuring one or two of these carefully selected individuals in each newsletter. Jen Sleeman is originally from Coopersburg, Pennsylvania and is attending school at Lees McRae College in Banner Elk, North Carolina. She knew she always wanted to work with animals so she found a specialized program where she could get hands on experience with wildlife rehabilitation and work in conservation education. Sleeman will graduate this December with a B.S. in Wildlife Biology with a concentration in wildlife rehabilitation. While interning at the Foundation, she has been working on a raptor pellet (think raptor throw up) project which showcases the different types of pellets raptors create depending on what type of prey species they are eating, as well as showing how pellets can vary by different species of raptor. 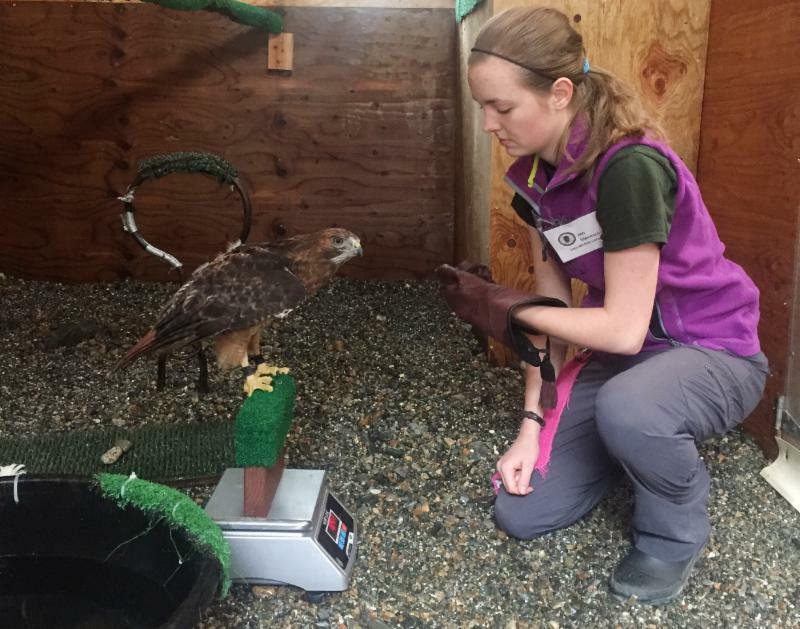 Her favorite part of her work at the Foundation is getting to work with Sitka, a red-tailed hawk and learning about raptor behavior. Thanks for your hard work so far, Jen. A Huge 'thank you' to Our Amazon Wishlist Donors. This last month, we had anonymous donors purchase items off our Amazon wishlist. Many of the items on our wishlist are things that we use on a regular basis to clean and maintain our raptor center and museum. Additionally, our Amazon wishlist is a great way to support our resident birds. You can purchase items to contribute to our Emergency Preparedness plan, enrichment, or everyday necessities like cleaning or medical supplies. Click here to browse through our wishlist. Shopping with Amazon? Smile and help out the ABEF! If you shop online at Amazon.com, you can support the ABEF by shopping Amazon Smile. Amazon Smile offers the exact same services as amazon.com, however a portion of the amount you purchase gets donated to your chosen, registered charity. 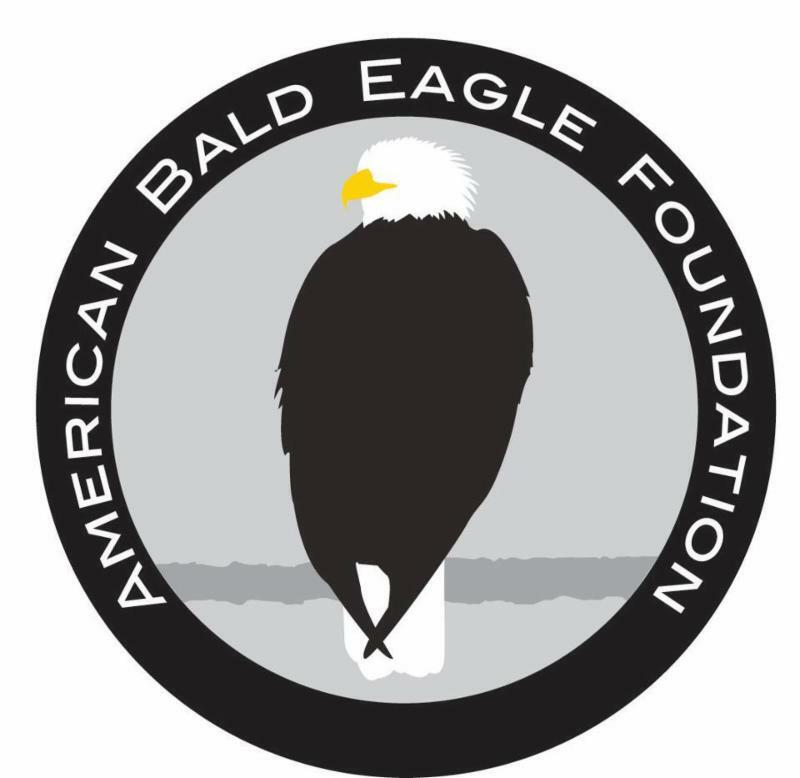 The ABEF is on Amazon Smile, so we encourage you to look us up and shop to support the American Bald Eagle Foundation every time you shop with Amazon. (Remember to go to www.smile.amazon.com).